Sorbic acid is a preservative found in many foods and skin products. It is considered non-toxic, so you are unlikely to experience problems eating foods containing the chemical. However, you might suffer a sensitivity reaction when substances with sorbic acid come into contact with your skin, eyes or lungs. These reactions are typically minor and not life-threatening. Sorbic acid is a preservative originally derived from the berries of the rowan tree. The tree is also known as the mountain ash tree or by its scientific name of Sorbus aucuparia. Sorbic acid can also be produced synthetically. It slows the growth of yeast and mold and is widely used as a preservative in foods and skin products. It is considered nontoxic, but you can suffer minor symptoms if exposed to large amounts of the chemical. The Material Safety Data Sheet found on the Oxford University website shows sorbic acid can be irritating to the skin, eyes and respiratory system. 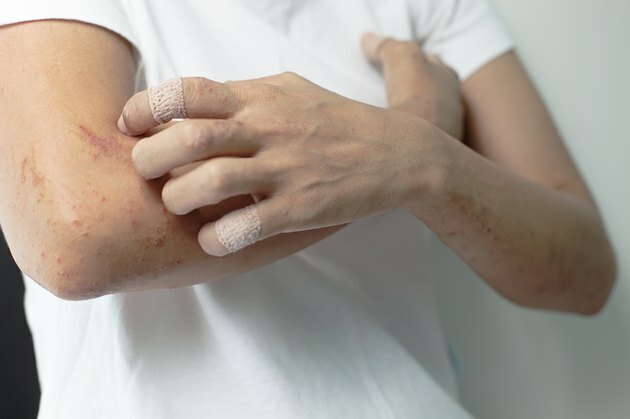 Dermnet NZ, an informational website run by the New Zealand Dermatological Society, says that skin contact with sorbic acid can cause a rash known as contact urticaria. This is a minor and temporary skin condition that occurs within minutes of a substance containing sorbic acid coming into contact with your skin. Symptoms include redness, swelling, tingling and itching. The condition is not serious and should fade within 24 hours. Dermnet NZ says that contact urticaria can affect other organs with what are called extracutaneous reactions. These symptoms are rare in sorbic acid exposure, since sorbic acid contact urticaria is a non-allergic reaction, unlike other sources of the condition, such as latex or antibiotics. However, if you are exposed to sorbic acid, there is a small chance you will experience watery eyes, wheezing, runny nose or other symptoms of irritation. Sorbic acid reactions are usually quite minor and will resolve themselves within a few hours. The best treatment is simply to clean the material containing sorbic acid off the affected area and to avoid the substance in the future. If symptoms seem severe, call the National Poison Control Center at 1-800-222-1222 for further guidance from a qualified expert. This hotline is available 24 hours a day, seven days a week and is available for both emergency and non-emergency situations. If your symptoms are severe, the hotline may direct you to visit your local doctor or emergency room so antihistamines and adrenalin can be used to get your symptoms under control.